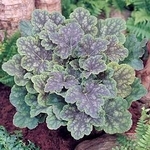 Heuchera 'Mercury' features mint green leaves marbled in maroon to black. Mysterious and alluring, just like the planet. Light pink flower buds open into even lighter pink flowers. This European coral bells is one in a series from the "Planet Collection". FLOWER: Light Pink, early to mid season.